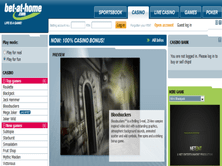 Bet-at-home Casino isn't limited to the online casino offer. It also provides access to a sportsbook and other attractions. However, the casino site is certainly worth exploring. It is designed in a neat manner. The main emphasis is on the games that are present on the site. These games frequently feature some astonishing graphics. The sheer amount of available games is also noticeable. In fact, it would be difficult to find a bigger offer of flash-based games. The current winners list is constantly updated, which shows that more people are achieving their objective and winning prizes. The promotions section doesn't just feature deals that are associated with the online casino. It also displays special deals for sports betting enthusiasts. 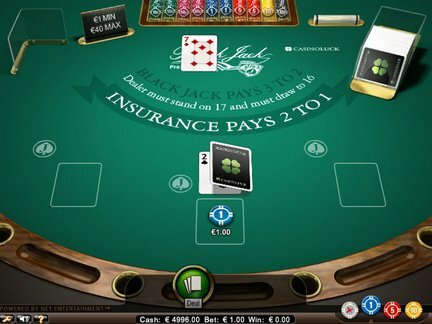 In terms of casino-specific deals, the website offers a 100% up to $/€100 match bonus. It also provides a $/€1500 poker bonus. A winner of the day can take $/€50. Depite the fact that the aformentioned deals are quite good, the competition appears to have a bigger deal offer. A few more Bet-at-home Casino Bonus deals would be a nice addition to the existing offer. The website supports a number of different deposit methods. They would include; Sofort Banking, Visa, MasterCard, EuroCard, Diners Club, Skrill, Przelewy24, iDeal, PaySafeCard, Neteller, Bank Transfer and Voucher. A free betting account can be opened rather easily. A brief form needs to be filled out in order to sign-up. The jackpots are filled to the brim. Therefore, the registration really pays off. The casino game software comes from powerful NetEntertainment platform, which is a sign of excellence and quality. Since the website also has a live casino section, it is especially attractive to players who would like to interact with live dealers. The site is the largest online bookmaker in Europe. It evidently has a European focus, which can also be discerned by looking at the € currency support. The access retrictions are shown in the terms and conditions. Here are some of the countries with such restrictions; Belgium, Denmark, Estonia, France, Hungary, Latvia, Lithuania, Mexico, Northern Ireland, Philippines, Portugal, Romania, Russia, Spain, Singapore and United States of America. The website features a wide range of games. They can be chosen from the following categories; Slots, Roulette, Blackjack, Table Games, Live Games, Video Poker, Other Games and Jackpots. Here are some of the more prominent games; Aloha! Cluster Pays, Drive: Multiplier Mayhem, Fantastini Master of Mystery, Guns N' Roses, Glow, Koi Princess, King of Slots, Pyramid: Quest for Immortality, Wonky Wabbits, Starburst, Bloodsuckers, Cosmic Fortune, Mega Fortune, Twin Spin, Fruit Shop, Hook's Heroes, Dazzle Me, South Park, Dracula, Aliens, The Invisible Man, Neon Staxx, Stickers, Steam Tower, Tornado Farm Escape, Spinata Grande, Fruit Shop Christmas Edition, The Wish Master, Lost Island, Lost Bananas, Wild Water, Jack Hammer, Space Wars, Devil's Delights, Jackpot 6000, etc. Since Bet-at-home Casino is a well known brand, the expectations are rather high. It appears that the players appreciate the casino. It has an above average rating. Unforunately, the accumulation of unresolved complaints stick out like a sore thumb. It would be nice if the popular casino focused a bit more on resolving such complaints. Right now, it offers help via phone and e-mail. The casino was established in 1999. It has received a license from the Malta Gaming Authority. This licensing body has been operating for a long time. It has managed to become a respected licensing authority. The license is certainly superior to what many other online casinos have to offer, especially those that have a business-only license. I think that the entertainment is the biggest thrill. The available games are picked out in such a way as to preserve the most liked titles. I also appreciate the wide range of game categories. When I look at the promotions section, I am not entirely impressed. I believe that it could be improved with the addition of a few more deals. In my opinion, the website deserves to be recognized, despite the small promotional offer.